Ditto’s New Puzzle Piece – The best one yet!! Monsters!! 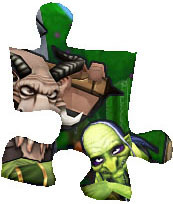 And here it is, at long last – Ditto’s fourth exclusive puzzle piece for the Wizard 101 Puzzler! I have to say – this is the most exciting piece I’ve seen yet – it’s monsters!! It looks like some creepy zombie thing and some kind of hairy horned monster to me! What does everyone else think? This entry was posted on April 4, 2012 by dittowizard. It was filed under Puzzler, Wizard 101 . That horned looks like a minotaur… I say, all this medieval stuff makes me think of Avalon, a mentioned world on the streets.